I made this piano tutorial since all my students are crazy about Lady Gaga. So here's a song with five chords or so that will show you how to play different accompaniments which you'll be using in many different pop songs. 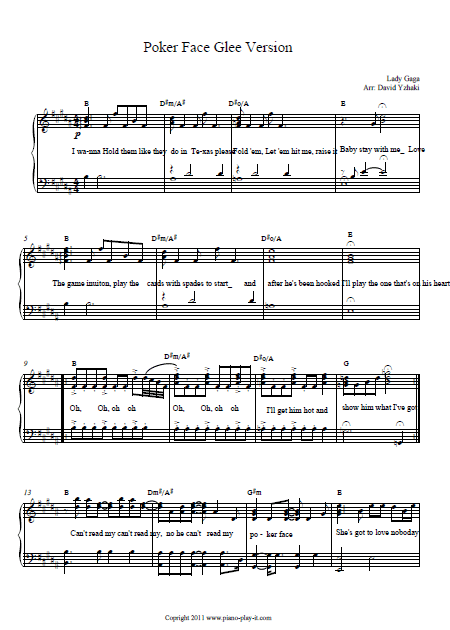 Therefore I decided to create a piano tutorial of the Glee version which is sang with piano only. This piano sheet of Poker Face can be downloaded with last version of Adobe Reader. Click here to download it. Click here if you haven't signed to Piano Playground, our free E-zine yet make sure you do that in order to get the username and password codes for the Lady Gaga Poker Face Piano sheet I provide here under. Here's a free piano sheet of the song as played in this tutorial to help you through the way. To begin with, remember that this piano sheet is in B major. This music scale has five sharps so make sure you're familiar with the scale before starting to play the piece. As you starting to work on the groove choose a slow paste so you'll be able to work on the coordination of the song and work it out smoothly. Try to divided the song to parts and work slowly on each part apart. Pay attention to the chord that changes while playing the chorus. Try to play the song in steps just as demonstrated in the piano tutorial. Start switching the chords in blocks and only then add the groove.